The good news is that this year aliens haven’t yet come down to Earth yet, whereas last year there were two UFO sightings. How do I know? Wikipedia! For your convenience, I have visualized the information below. The really great news is that the viz will automatically refresh every 24 hours—even if the author were to get abducted by aliens tomorrow. The new Google Sheets connector in Tableau Public 10 makes this possible. Tableau Public requests a new extract of the data, which is stored in a Google Sheet, every 24 hours or whenever the author hits “request update,” and updates the viz accordingly. 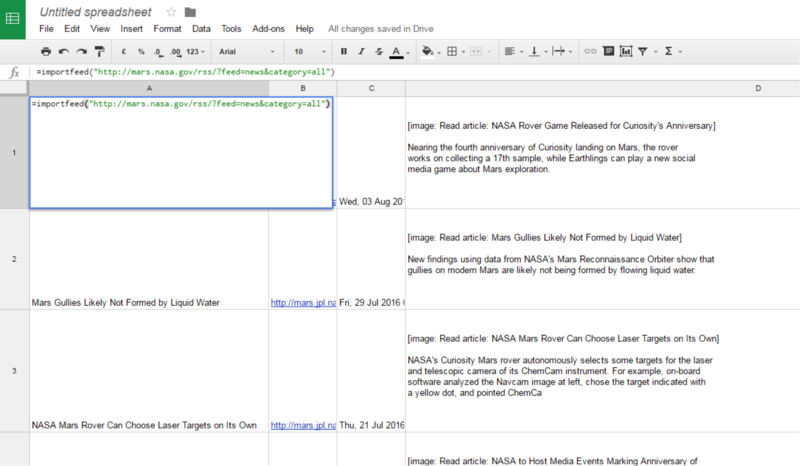 How does the data get into the spreadsheet on Google Sheets in the first place? In our blog post announcing the launch of Tableau Public 10, we briefly showed that you can pull in web data using ImportHTML. Here, let’s take a closer look at how that works, as well as at three related formulae. 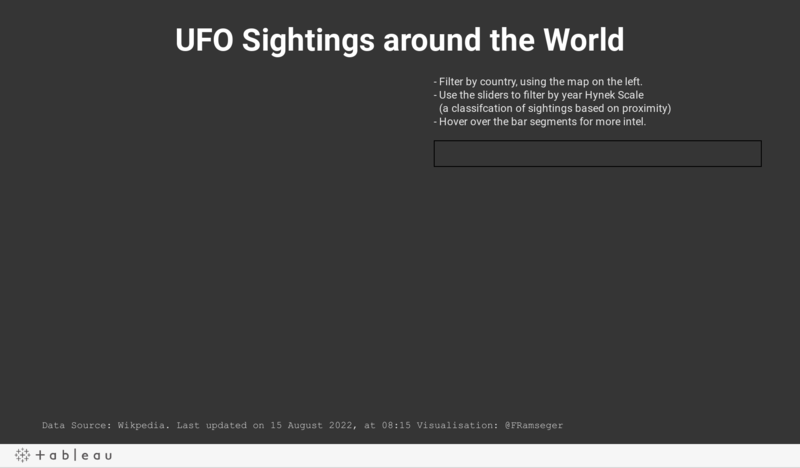 The information about UFO sightings comes from this Wikipedia page. In particular, I used the two tables about UFO sightings in the 20th and 21st centuries. 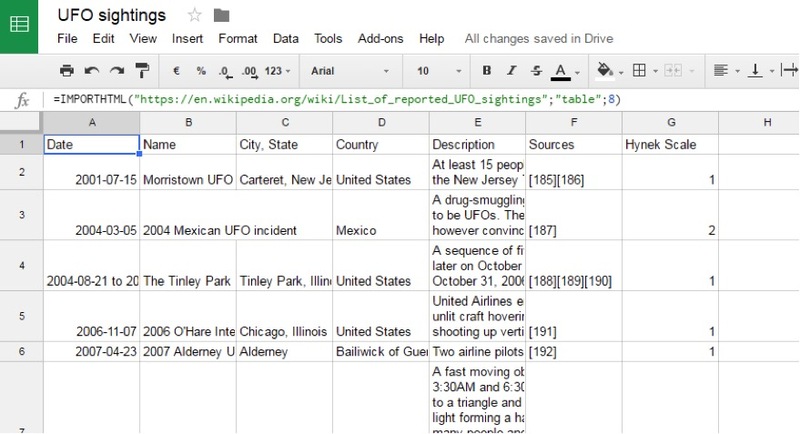 You can import a table from any website into Google Sheets with the ImportHTML function. It is surprisingly easy. Try it out. We can now connect to that table in Tableau and build a viz. (Connect -> Google Sheets -> log in with Google credentials -> select table). What’s more, upon saving the viz on Tableau Public, we can tick the checkbox “keep my data in sync.” That ensures the viz will always reflects the latest information that the gremlins have entered on Wikipedia. First comes the URL of the website. Make sure you put that in quotation marks. Alternatively, you can also refer to a cell that contains the URL. Wikipedia pages with tables work very well, but it can be literally any website with a table or list. First, you can add other columns to your spreadsheets, but be careful that the ImportHTML function has enough space to populate the table. Second and related, it is not really possible to stack several tables on top of each other. That’s because you might not know how many rows a table has, and you might overwrite the table below. Instead, use the Union feature in Tableau. Finally, as convenient as it is to make use of crowd-sourced information on Wikipedia, beware that when Wikipedia entries are edited, the structure of the page might change. For instance, I recently created a tracker that pulled the latest results from a large sporting event that recently took place in the Southern Hemisphere. Based on the pages for previous editions of the event, I had good reasons to believe that there would be a table on Wikipedia listing the achievements of different nations. However, when the action kicked off, the page for the 2016 edition was being edited heavily. And twice the location of the table I was referencing changed, leaving my tracker hanging with no data. If you think the website might change, you might want to check in on your viz from time to time. What if you’d like to access information on a website that is not in a list or a table? You can do that with the ImportXML formula. I then added this as a new data source in my Tableau workbook ( Data-> New Data Source). I stripped the date and time out of that sentence using custom splits on “ on “ (i.e. the word preceding the date), and created a new sheet with this new field as text. Then I added that sheet to the bottom of my dashboard. Same as before, the URL of the website in question. A handy trick to get the x-path of an element is to use the “inspect” function of your browser. In Chrome, for instance, you can select the element, right-click, and choose “inspect” in the menu. In the right-hand panel, the html code related to that part should already be highlighted. Right-click on it, and select copy - > copy x-path. Once you get the hang of it, there are lots of cool things you can do with ImportXML. The sky is the limit, but here one more example to get your creative juices going: Try grabbing the number of followers from your Twitter profile. Of course, many websites don’t spit out data in forms of tables but as a downloadable file. Using the ImportData function, you can get comma-separated (CSV) and tab-separated (TSV) text files into Google Sheets. Don’t forget those quotation marks if you are writing it directly into the formula. By default, it gives you all the items currently published by the feed. You can choose to only retrieve certain columns, or specify the number of items. See here for more information about this as well as the other formulae mentioned above. There are many ways to get your data into Google Sheets: via manual entry, via a webscraping service such as Import.io, or via tools like Zapier or IFTTT (as described by my colleague here). The import functions described above are a good alternative for web data that is relatively well structured and accessible, such as tables on Wikipedia. If you want to get started with Tableau and are still looking for data, why not browse Wikipedia for an interesting topic? UFOs are not everyone’s cup of tea, but with five million pages on the English Wikipedia, there is something for everyone. Send us your vizzes based on your favorite topic! Post them in the comments below or tweet them to us @tableaupublic.